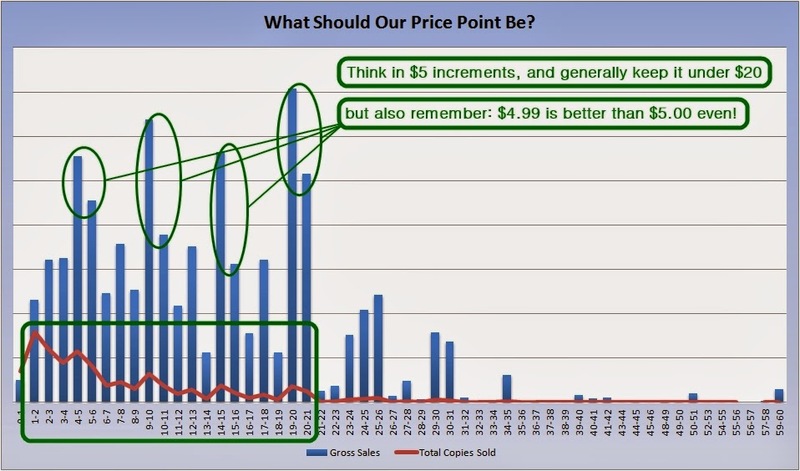 Just a little over a year ago, OneBookShelf's CEO, Steve Wieck, blogged about pricing strategy for your RPG and RPG-related products. If you haven't read it, you should take the 5 or 10 minutes to do so. There's lots of great food for thought there. It is derived from combined sales on our RPG marketplaces from all sales in 2012 and 2013. 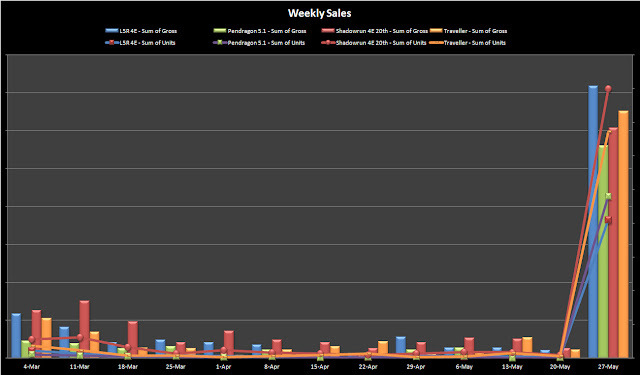 Although some of my charts are labeled "Gross Sales" here and there, that's just my own sloppiness. In every case, what I'm looking at throughout this pricing examination is the publisher's revenue per title. We're only talking about digital downloads. Print titles are another topic for another blog. For sales by category or genre filter, some data gets duplicated: When we sell a Paranoia product, for example, and that product is categorized as both Sci-Fi and Comedy genres, then both of those genres get credited for that sale in the metrics. None of these analyses take into account publisher notoriety or product quality. It stands to reason that more famous publishers, better-known game lines, and titles with higher production quality can skew the results or prompt different buyer behavior. We’d supply more metrics, but we have to find the right balance between transparency and confidentiality with publishers. One of the most common questions we hear from new publishers, and one of our perennial issues for debate internally, is how to price products optimally. Let's take a look at what price points have done best on our marketplace in the past two years, in terms of gross revenue. There are spikes at each of the $5 increments, but that makes perfect sense since those are also the most common price points for products on our site. Of course, since they are also the most common price points, this set of data really only tells us what's most common, not necessarily what's most effective, so let's look at things another way. But of course that picture doesn't tell the whole story either. 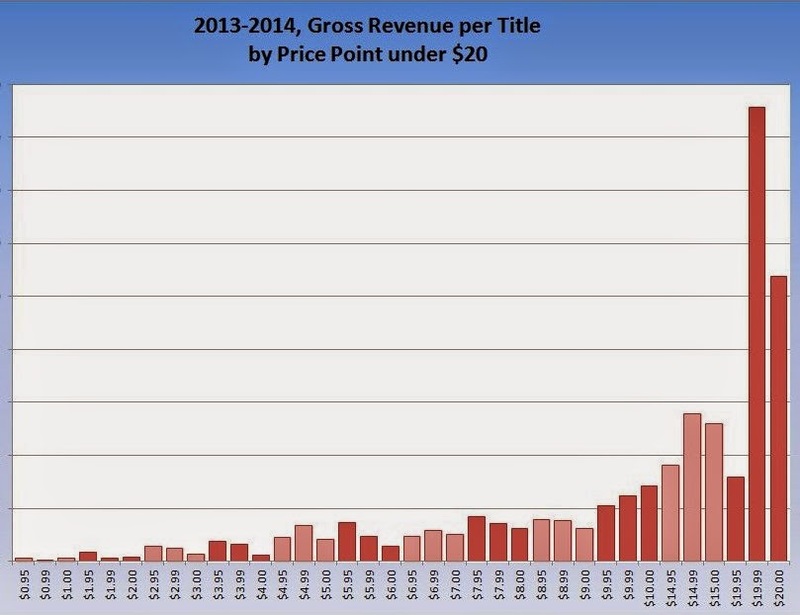 Looking at the graph above, you might think that pricing your title at $30 is the best option. Let me assure you that's not true! 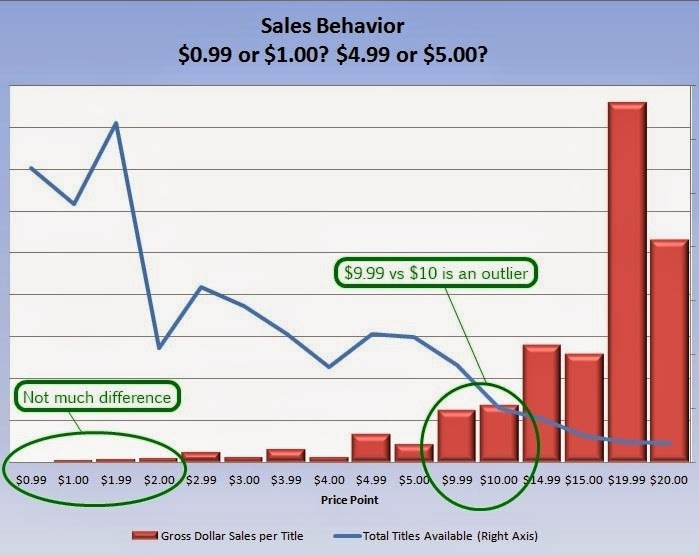 In actuality, what's more significant is the behavior of each individual title relative to the total number of titles available at that price point; looking at product behavior this way, we have a clearer sense of what are actually the most successful price points on our store. Here's what that analysis looks like, boiled down to a pretty straightforward infographic. 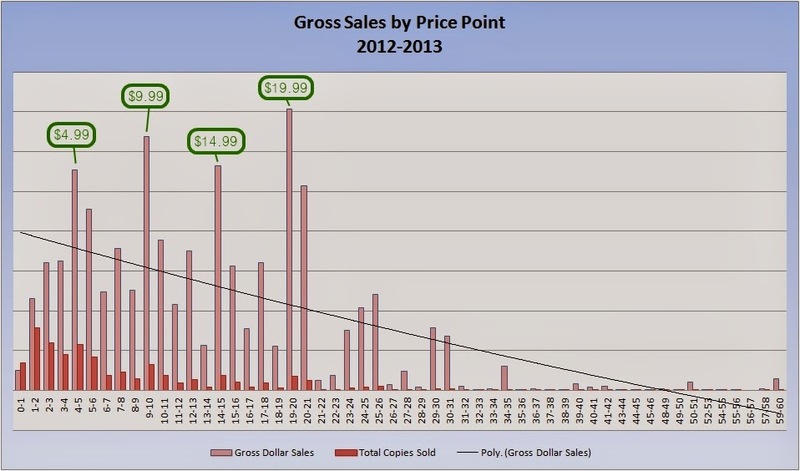 As you can see above, the $20 price point is actually the best bang for your buck, just as our "gross dollar sales" chart (Fig. 1) above suggested. In fact, it's almost uncanny how much Figure 3 and Figure 1 resemble each other, if you look closely. Pricing digital copies of your titles any higher than $20.00 is probably going to net you far fewer sales and thus a much lower product performance. But any title price priced around $5, $10, or $15 is also going to do well for you, statistically speaking. NOTE: Our buyers generally know just how much they're willing to spend for a given type of product or amount of content. You can't just charge $19.99 for any product and expect to do well; you need to charge what the item is worth in the collective opinion of gamers. A 24-page supplement on some niche character class like a "fog wizard" or something isn't going to be perceived as worth $19.99, so you'd be mad to charge that amount for it. A buck or two for such a title is probably more appropriate. And of course there are outliers. 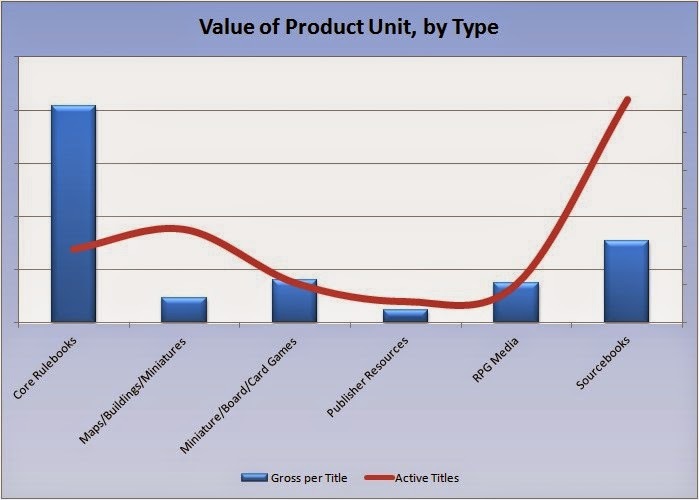 Extremely popular titles can deviate from this pattern, and less popular publishers or specialized niche products might experience a different behavior. Remember, we're talking about generalities here. What's Better? $X.99 or $Y.00? Lots of people have examined the difference between pricing of, say, $4.99 and $5.00 (just google "marketing power of 9" and you'll see what I'm talking about); the prevailing wisdom is that prices of $X.99 will always perform better than the round dollar price. We thought it would be interesting to see if the data from our site support this sales truism. Since we already know that prices of $20 or less perform best on our marketplace, I limited my analysis here to products priced in that range. The results were not too surprising. In short, at most dollar increments the "X.99" price performs better than the neighboring "Y.00"; yet let's take a closer look at prices of $5.00 or less, so you can see the difference a little more clearly. Then, in a recent meeting when I was showing this chart, my colleague Matt McElroy asked, "That's cool, but I wonder if $X.95 is any different than X.99?" What's Best? $X.95, $X.99, or $Y.00? I'll save the long-winded details and just show you the results of this analysis—which turned out to be much more surprising than the last one shown in Figures 4 and 5. We already know ~$20 titles are the best performers on our store, but it turns out $19.99 is the real winner. Still, what's more interesting to the numbers geek in me is the fact that, at almost every dollar increment, the X.95 price point outperforms both X.99 and Y.00. It might be a little hard to see the relative difference for some of those bars in Figure 6, so here's another version of that graph, cut down to products at $10 or less, annotated and blown up a little. How about prices under $1.00? Or, is $0.50 a good option? One other issue that's of particular importance to us is pricing under $1.00, since every download from our site has a small operational cost for us. As prices drop further toward that mark, somewhere around $0.30, we actually start to lose money on each download (which is why we usually stipulate that prices (aside from free products, which play a dual role as a sort of loss leader and promotional tool for us) should go no lower than $0.50). In any case, do products priced under $1.00 actually trend relatively well? It turns out that, if you're one of those folks who thinks that always dropping prices below that of your competition is the best course, you'll need to think again. The upshot? If your product isn't free, then don't charge anything less than $1.00. NOTE: This analysis does not include PWYW (pay-what-you-want) titles, which are outliers and should be the focus of another blog in the future. As I noted at the start of this examination, none of these data recognize publisher notoriety or product quality. Where a new, unproven publisher should probably stick to $5.00 or less for a small game supplement, one of the "big 20" publishers on our store can probably afford to charge a bit more for a similar title of the same size. But I still believe everyone should be taking a good, hard look at how they're pricing their products. That said, what are the best prices for different kinds of products—adventures vs. maps, core books vs. pre-generated character folios? What kind of products should you be publishing? Well, that we can't tell you. But what I can offer is a glimpse into what kinds of products do best on our marketplace. 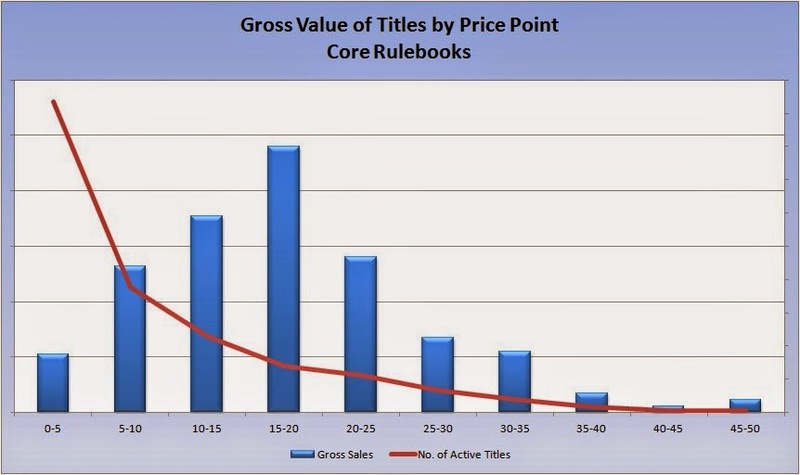 It's likely not going to be a surprise to anyone—particularly no one who checks publisher sales reports on DriveThru—that core rulebooks do better on our store (by a significant margin) than any other type of product. One thing to consider: There are lots of different kinds of sourcebooks, for instance, and this analysis doesn't make any distinctions that far down the filter list. Do longer adventure mega-modules do better, by page count, than collections of brief scenarios? That is a matter for a future investigation. For brevity's sake, I'll limit this to the two most significant groups, Core Rulebooks and Sourcebooks. Earlier, I talked about optimal pricing for products on our store in general, but of course there is going to be some difference based on product type, size, and production quality: Core books tend to be bigger and more lustrous than other types of books (except maybe coffee table art books or something), for example, and more universally useful, so it makes sense that people are willing to pay more for them. We already know that $19.99 is the magic number for products on our store generally, but how does this hold up for core books? Should they be priced higher? Have a look. Again, digital books should rarely be priced above $20. Some top-end, popular core books see success at $24.95, $29.95, or even $34.95, but the fact remains: In general you should be pricing your core book PDFs at $19.99 or less. What about rule supplements and adventures? What's the best price for them? Of course it will depend on the quality of the book and its size, but here are the general stats. The spread is a little more even here, up to $19.99, but as you can see the winner in this category is the $5.00 to $10.00 range, followed closely by $5.00 or less. Some more investigation is in order for this category in particular, but I hope this at least gives you some idea of where to price your books, based on their size and content. Maybe at some point in the next month or so, I can offer some more insight into the vagaries of pricing for specific types of products within each broader category. I was also curious as to which genre category performed best. But again, note that there are publishers who, through their huge catalogs of products, can skew these data. For instance, White Wolf, consistently our best-selling publisher year after year, sells almost entirely "Horror" titles, so their influence on that genre's numbers can't wisely be ignored. 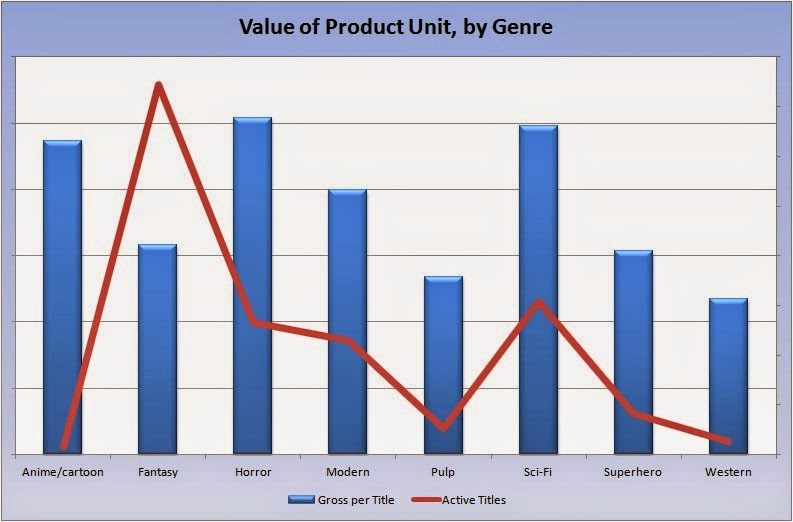 Likewise, the huge number of "Fantasy" titles on our site is almost certainly skewing the relative value of those products downward (just as the relatively small number of Pulp and Western titles may skew their apparent value upward); numerous publishers have greater success with titles in the Fantasy genre than in any other. Steve's blog post last year focused on "free pricing for reach" and on the "Steam-like" deep discount sales events we've been holding—like this one for Rite Publishing—invariably with great success, for the past 18 months or so. I want to follow up on that latter topic now that we've had a bit more time to experiment with "deep discount promotions." Last year in May, we held one of these week-long sales on four of our platinum-selling titles. At that time, we weren't tracking these kinds of data as closely as we do now, but I did throw together this snapshot of the results of that sale. As you can see at a glance, the sale resulted in a dramatic increase of revenue for all four titles. Without giving away those publishers' actual sales numbers, here's the result in terms of an increase in gross sales revenue over the previous weekly average revenue for the duration of the promotion. It would seem, from this promotion at least, that—all other things being equal—publishers should earn something approaching 20 times as much through a deep discount promotion as they would in any typical week selling that same title. To reiterate, we're talking about gross revenue by title, not units sold. Note that all four of these titles were reduced by the same percentage, at 75% off their usual digital download price. Now let's take a look at a similar promotion, but one in which not all of the titles were discounted by the same amount. Just last month, we had our annual Tabletop Day sale. Below is a screen capture of the sale page from that event. As you can see, the individual titles' discounts range from 50% at the low end up to a full 90% off. The relative results of the sale, by title, are roughly commensurate. Unlike the previous platinum sale from 2013, revenue by title ranges here from 3.5x on the low end up to over 60x on the high end (for Solomon Kane). The 6000% increase in revenue for Solomon Kane dwarfs the other results. More significantly, though, it was the title with the greatest discount, at 90% off its MSRP (66% off its usual digital price on our store). Solomon Kane earned more revenue in this one week than it had in the entire year previous—despite its being on sale for 90% off. 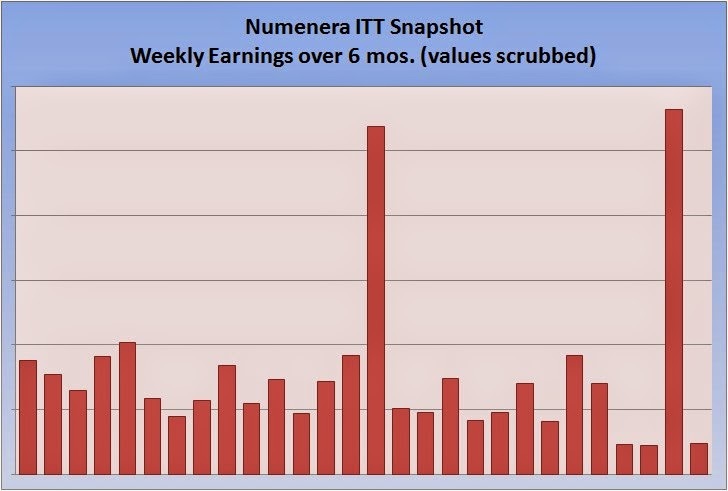 Numenera seems to have had only a surprisingly small boost from the sale. 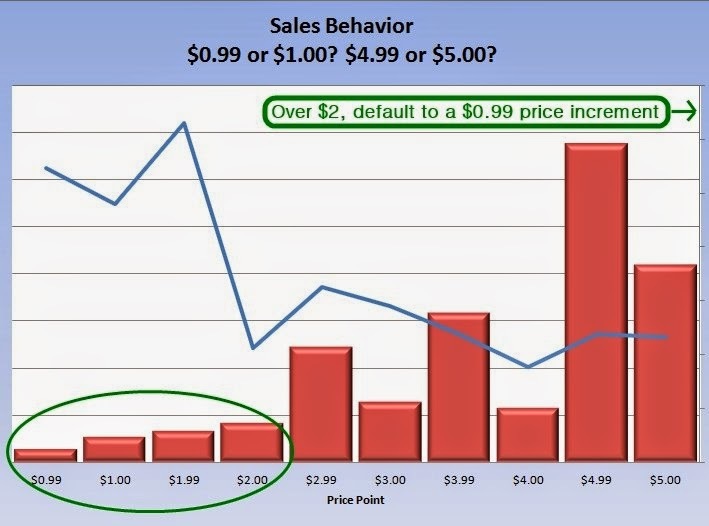 Part of that is simply perspective, as you can see in Figure 16; in addition, the earlier spike you see on the graph, in the center, represents sales during the "New Year, New Game" sale in January, when the Numenera PDF was also on sale for $9.99. Keep in mind too that this relatively new, top-shelf title has strong weekly sales numbers to begin with, even at its regular $19.99 price. Hero Kids also seems to have had relatively little upturn from this promotion. Note that it is also the title with the smallest amount of discount, at just 50% off. The fact that its usual cover price is also relatively low ($5.99) could also be a factor, but then it's also a children-oriented product, unlike the others, so it's definitely an outlier in several ways. 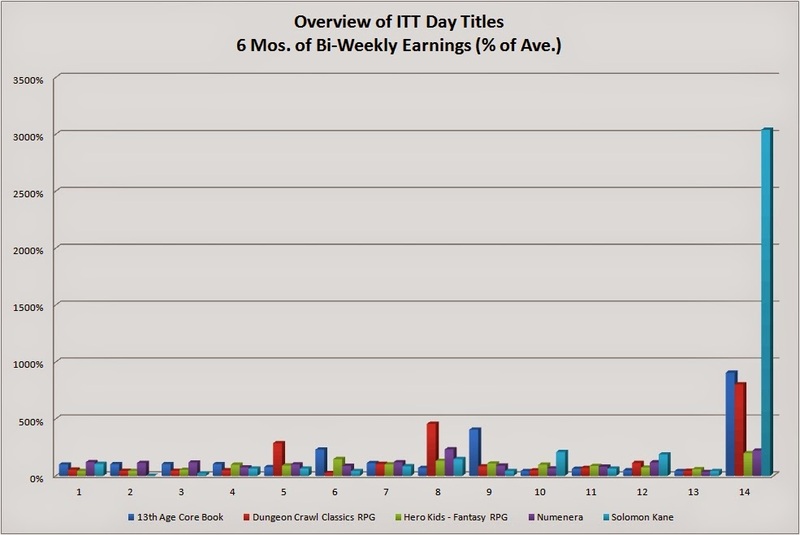 Of the other two titles, Dungeon Crawl Classics and 13th Age, both fall into the expected range based on the previous platinum promotion—i.e., something approaching 20 times their usual weekly income. Yes, 13th Age grosses higher in terms of the increase over its average weekly revenue, even though it's only marked to 60% off (as opposed to DCC's 80% off), but then 13th Age is also a much newer product, and thus presumably is more appealing to informed buyers (some of whom might already own DCC, since it's been out for a few years). So what can we take away from this? Well, admittedly we still don't have enough data to make perfect or comprehensive decisions (and this is a correlative, not a causative analysis), but given the results above, we can make a few safe assumptions at least. Keep your PDF prices under $20. For a deluxe core book, you might be able to get away with $24.95, $29.95, or even $34.95, but as a rule, $19.99 is the ceiling. 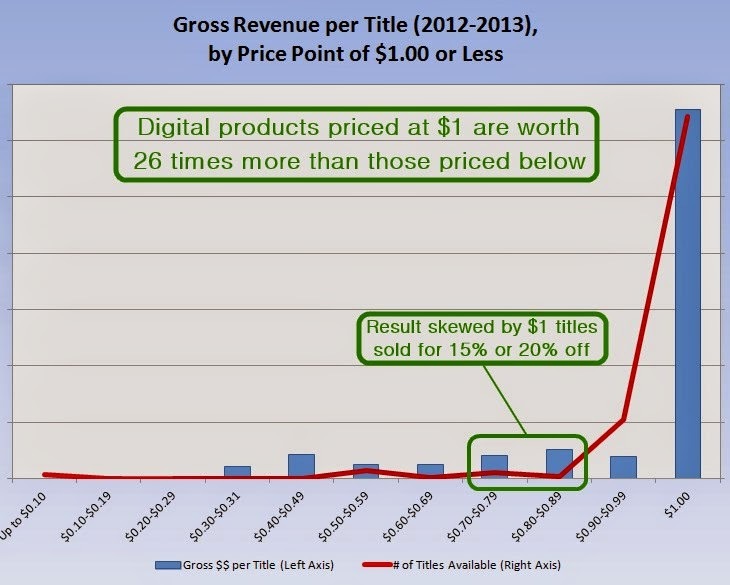 There's no point in pricing any title under $1.00 (unless you intend to give it away). With only a few exceptions, an $X.95 price should do better than either $X.99 or $Y.00. 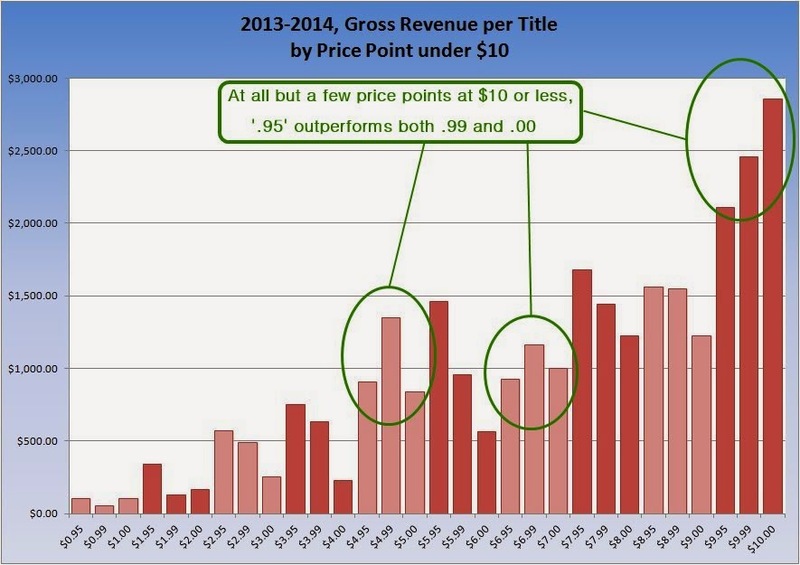 According to two years of sales data, in terms of expected return per title, the most successful price points are $1.00, $2.00, $2.95, $3.95, $4.99, $7.95, $10.00, $14.95, and $19.99. All other things being equal, if your sale price for a title is at least 60% off, you can expect to make somewhere in the neighborhood of 15+ times your average weekly revenue. Better yet, your unit sales are increasing dramatically as a result of this kind of promotion; more people are getting to know your core product, potentially (re-)invigorating the line. 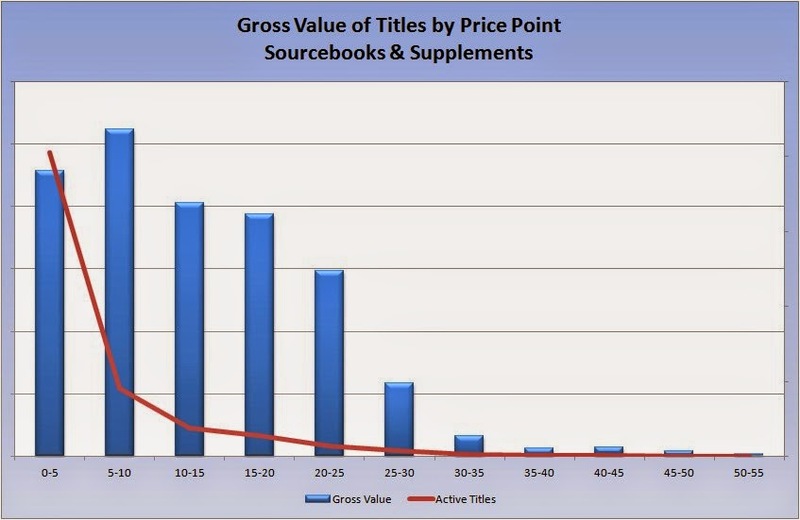 Presumably, some of them will be more likely to buy further titles from you, meaning greater sales over time. Your title needs to have broad enough appeal to a core population of gamers to draw attention when it goes on sale. This "sale furor" is a big part of the Steam-like sale's success. For less well-known publishers or products, we can't say with certainty what effect this kind of promotion will have. There's lots of room for experimentation here. So what does all of this mean to you? Well, first, I hope there are some pretty clear indicators above about how you should be pricing your products. But if you're interested in clarification, then by all means reach out to me (scott@onebookshelf.com). I'm happy to discuss! Secondly, you should be willing to experiment. Only by trying different pricing strategies and sales tactics will you find optimal success. And don't assume that once you figure things out they will stay the same. Prices and markets fluctuate over time. Just because something worked for you last year (or 5 years ago! ), that doesn't mean it works now, or that it will still work in a few years. And finally, please feel free to share this around and discuss across your social network. If your experience has differed from what I've outlined here, I'd be fascinated to hear about it.